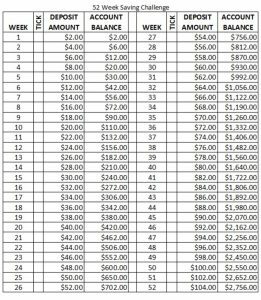 A 52 - Week Savings Plan So Simple Even I Did It! You are here: Home / Money / Business / A 52 – Week Savings Plan So Simple Even I Did It! 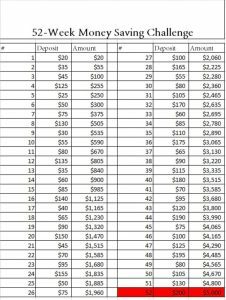 A 52 – Week Savings Plan So Simple Even I Did It! (ThyBlackMan.com) Thursday night I was driving to the store (Ok it was a Bunt Cake Store- I lost momentary control!) and heard on the radio several Federal Prison Guards talking about the hardship of this partial government shutdown. The inability to pay for gas, many single officers sleeping at the prison to save gas money. One guard in tears saying he and his wife discussed what could they afford to buy for their two-year-old son’s birthday. Having to decide between rent and food. Having to tell your child no, to a package of cookies in the grocery store. I feel great empathy for these employees. The partial government shutdown, which began Dec. 22, 2018, TEMPORARILY ended January 24, 2019. Watching DC, these past four weeks reminded me of my first week substitute teaching an 8th grade math class. I lost complete control of the monsters (sorry, wonderful kids). I could not reason, get them to stay in their seats, be quiet monsters, or negotiate a truce. The school Principal eventually had to come in and with just a look (Sort of a combination of John Wayne and Denzel when he is angry!) quieted my classroom. By the way, the principal was my Dad! The DC Congress Members very much remind me of that MISERABLE week! A pack of monsters! LESSONS LEARNED – WE HOPE! How many of these 800,000 federal employees will learn the need for emergency savings from this crisis? How many of you can withstand several weeks without pay and still pay your bills? The loss of income can happen to any of us who depend on an employer for a paycheck. Will we learn from this crisis? One survey showed 78% of American workers are living paycheck-to-paycheck. Do you have several weeks, preferably six months of expenses, stashed away in an emergency savings account? I do, because I have needed that money on numerous occasions. I started drafting a different blog this week on the financial impact of chronic illnesses, but decided to stay with the theme of the ESSENTIAL NEED, for emergency savings. As recent events have demonstrated, we all need to stash money in an emergency savings account. I recommend the 52-week challenge. You pick how much you want to and can afford to challenge yourself each week, but the amount increases weekly. This challenge is easy to follow where each weeks’ savings dollars, match the number of the week. It’s perfect for someone who wants more than $1,000 to look forward to at the end of the year. You can easily challenge yourself to save more than $1378. Start your first week with $2.00 savings and multiply by the week number by $2.00. To achieve $5,000 in savings will require savings of $100 or more for the several weeks. If you make this sacrifice, you will have $5,000 in your emergency savings account, for the day you need it. Emergencies pop up all the time, not just job loss. My furnace is over 20 years old. I know it may die any day. You hear this strange noise in your engine. You know the one when you take it to the dealer, your wonderful car refuses to make that noise. But eventually it might cost you well over $1,000 to have it repaired. We have seen the federal employees impacted by this partial shutdown struggle to pay basic bills. But for grace go I. 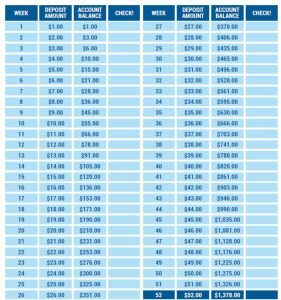 Whichever dollar amount you decide to go with, the beauty of the 52-week money-saving challenge, it adapts to your finances. With some planning and a little sacrifice, you can build an emergency savings account in 52 weeks! ALL COMMENTS AND FEEDBACK ARE WELCOME. SEE BELOW LEAVE A REPLY SECTION. PLEASE SIGN UP TO FOLLOW THIS BLOG by clicking AT THE TOP OF THE HOME PAGE: FOLLOW BY EMAIL. I am a proud nerd (my beautiful wife and daughter told me so) investment and finance blogger, with University Rutgers, MBA and Harvard University, Advanced Management. I am a successful investor in equities and real estate and happy to share my personal finance and investment lessons learned with you. I am NOT however, a licensed financial advisor. Please do not construe my suggestions on this blog, as recommendations for your personal situation. For individual finance advice please seek your own licensed CPA or financial advisors. One may visit this brother over at; Powers Investments Management and also connect via LinkedIn; S. Powers.